Vault of Light: Vanilla battle pets, mounts and achievements! Vanilla battle pets, mounts and achievements! I've had such a fantastic week in WoW! A friend I mentioned in an earlier post about my favourite WoW memory started playing again! When he logged into game I had to do a double take. He had stopped playing at the beginning of Cataclysm due to starting university I've been leveling my eighty five horde Warrior along side his Rogue. I haven't seen Mists of Pandaria from the Horde perspective yet so I've been really enjoying it. Patch 5.1 introduced a whole load of changes to the pet battle interface as well as a new pets to collect! 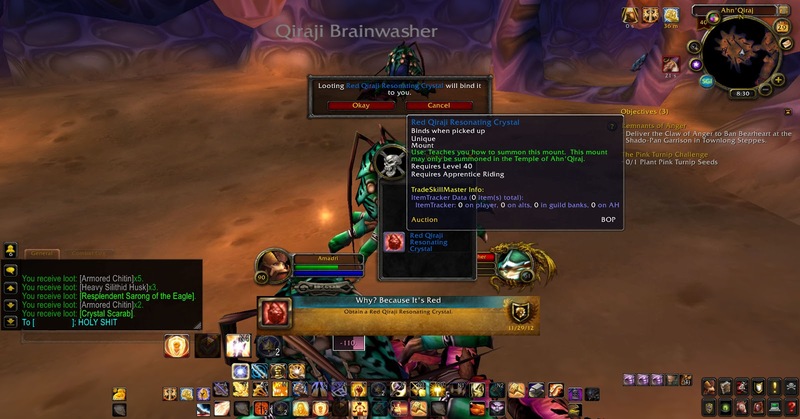 Along with the change came twelve new pets which have a chance to drop off of level sixty Vanilla raid bosses in Molten core, Blackwing Lair, Temple of Ahn'Qiraj (AQ40) and Naxxramas. While Naxxramas is a level eighty raid it was originally a Vanilla raid. You can find a list of the pets and their respective bosses on Warcraftpets. Each of the bosses have received some tweaks to make them soloable although some still require a little bit of patience, skill and knowing the tactics. While in Ahn'Qiraj hunting down the pets I was lucky enough to come across a Red Qiraji Resonating Crystal from some trash mobs. A mount I've tried to farm with no luck on multiple occasions. Obtaining this mount nets you the Feat of Strengh Why? because it's red. I then proceeded to loot another two within a few hours on other Alts. It seems that the drop rate on this mount has been significantly increased whether intentional or not remains to be seen. Now might be a great time to go snag yourself one just in case it's been an accidental change! 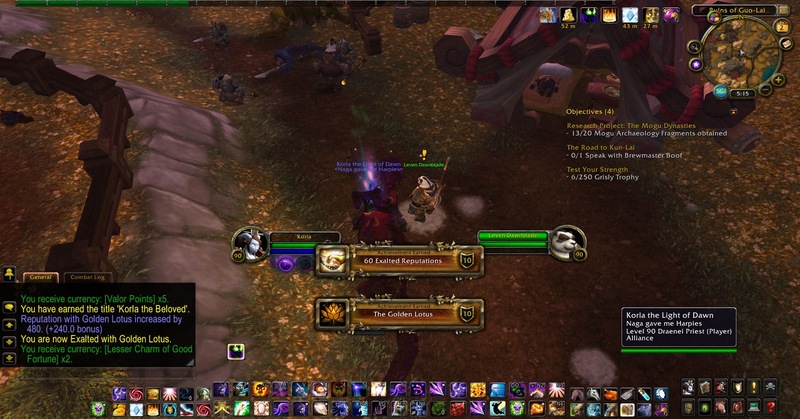 I finally hit Exalted with the Golden lotus! I plan on never doing any of those daily quests again for as long as I live. I'm not even sure why I loathe them so much they're not exactly hard quests but I have been putting them off most days. I also hit 60 Exalted reputations! I already know which ten I'm missing and I plan to remedy that as quickly as daily resets allow! The icing on the cake was finally finishing off my Glory of the Firelands Raider achievement. I had been missing two parts of the Do a Barrel Roll achievement for such a long time. The achievement requires you to kill Alysrazor in the Firelands raid without any members of the raid being hit by several of her abilitys. Thankfully you don't have to do all parts of the achievement in one fight. By finishing off the achievement I also completed the Meta and was rewarded my Corrupted Fire Hawk which I think might be my favourite flying mount in game! I'm one mount short of hitting 150 mounts. I haven't crafted any of the Jewelcrafting or Engineering mounts yet. Or reached Exalted with Shadow Pan, Anglers or August Celestials which I know all reward mounts. How has your week been? What's on your to do list for the upcoming week? 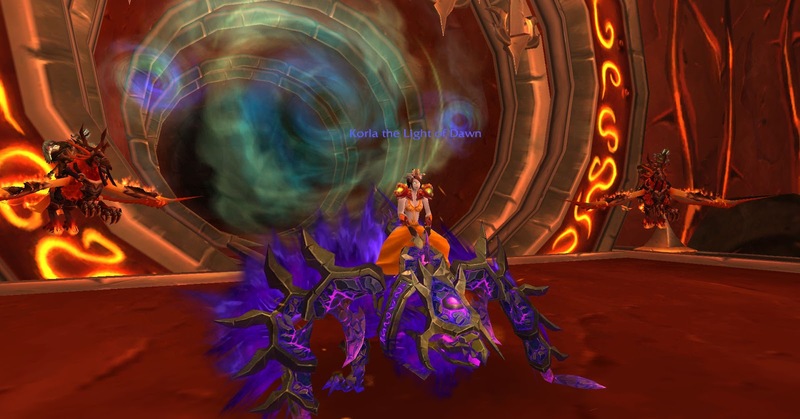 Have you tried soloing the old Vanilla raids yet for the new pets? Thank you! I love productive weeks like this. If only every week was the same, too much slacking haha. Woo hooooo! You go Girl! wish I could make myself stick to projects - seems it's just not my style though - I'll get there eventually but in the meantime, it's great to see you piling up achieves :D mwah!